Not only that, he recorded his first Major League hit that happened to score Joc Pederson for the fifth run of the game. As for what he did on the mound, I think it's best to characterize it as being effectively wild. In six innings he gave up two hits, two earned runs, six strike outs, picked off one and walked a whopping six batters. As relieved as he was afterward to be in possession of not one game ball for the victory but also a second one for his first career hit, Urias also knows he was fortunate. 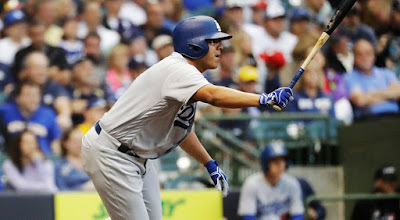 “I struggled with some pitches, and obviously the walks were too many for any starter, but the good thing was that we could get the win and we could get the results we needed,” Urias said. Watch Julio Urias speak about his evening with Alanna Rizzo here. "And it couldn't have happened to a tougher, more competitive guy," Lasorda said. "You look at Fernando and he has done everything in his career except a no-hitter. And now . . . this." In 1995 Hideo Nomo struck out thirteen Rockies to give him a then team record of 50 strike outs in four consecutive starts. In 1996 Mike Piazza hit three home runs against the Colorado Rockies at Coors Field. He is the fifth Dodger to hit three homers in a game. Happy Birthday, Pedro Guerrero, Rick Honeycutt and Wilbert "Robbie" Robinson! "I think we dodged a bullet," said manager Dave Roberts. "There's no fracture, just a bruised A/C joint. He's going to be day to day. He's sore, but no DL situation or anything like that. Right now, that's where we're at and the training staff is confident that's all it is. Now it's [pain] tolerance, and his mobility is minimal. But we're kind of relieved." This is disconcerting. Via Jon Weisman at Dodger Insider; "Clayton Kershaw having back examined in Los Angeles." Via Eric Stephen at True Blue LA; "Alex Verdugo has 3 hits in All-Star Game, Hyun-jin Ryu rehab start cut short by rain." Cary Osborne at Dodger Insider recounts how the twelve (nine of whom who played) Dodgers prospects invited to Tuesday's Texas League All-Star Game fared. Figueroa, 28, has appeared in 48 Major League games in three seasons with the Rays (2014), Yankees (2015) and Pirates (2016), batting .208 with nine RBI, and has a .291 career batting average with a .374 on-base percentage, 81 steals, 31 homers and 380 RBI in 815 minor league games since his selection in the sixth round of the 2008 First-Year Player Draft. The University of Florida product made the Pirates’ 2016 Opening Day roster and split the season between Pittsburgh and Triple-A Indianapolis, where he batted .307 with two homers and 11 RBI in 20 games. In 23 big league games this year, Figueroa went 4-for-26 (.154), primarily being used as a pinch-hitter (14 games), but also appearing at second base (five games, two starts), third base (two games) and shortstop (two games).